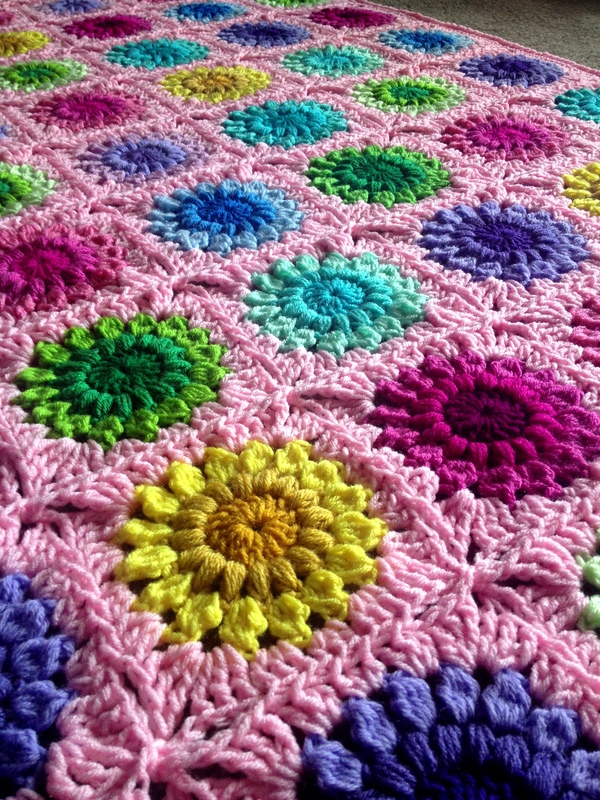 This blanket is based on the Sunburst Granny Square by my crochet idol, Priscilla Hewitt. 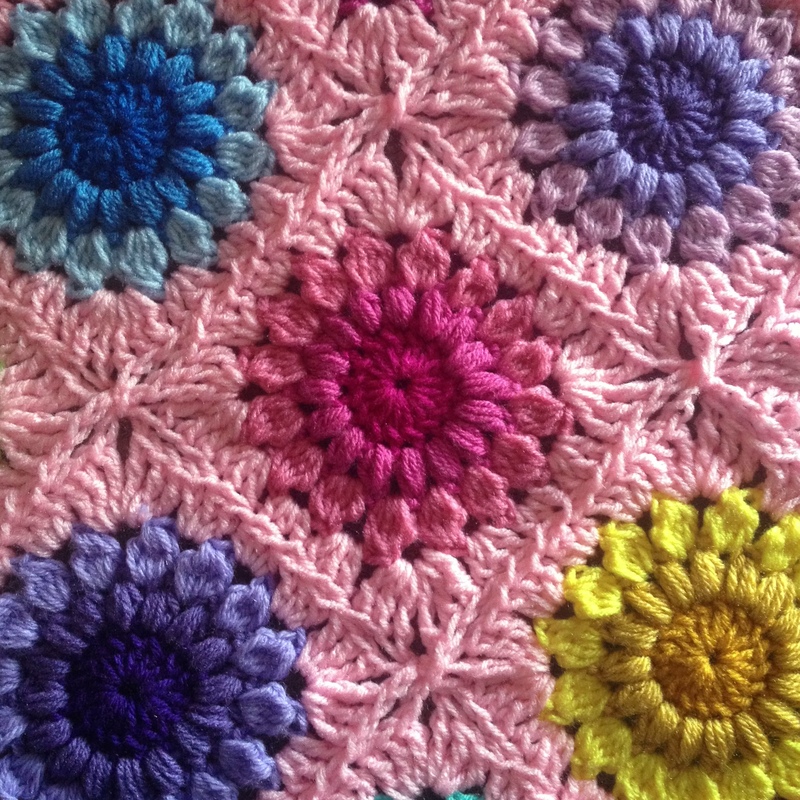 Color scheme borrowed from SnapDragons blanket – go check out her beautiful blog! Here are some of my flowers. I made 70 total for a 7×10 blanket that measured 48×64″ and I used worsted weight yarn with a size K 6.5mm hook. The join that I used is my own Gumball Blanket pattern join, the Mini-Twist, re-worked into the Continuous Join as You Go – see YouTube video tutorial by Crochet Cabana. I didn’t take a lot of pictures of the continuous join because the YouTube tutorial is so complete. Before you attempt my join, I recommend watching it and even taking some small grannies and practicing. You won’t regret it because it can be confusing if you don’t try it out first hand. I did end up writing a more complete version of the Continuous Join-as-you-go – find it here! See my post where I sing the praises of the continuous join here. Side note: Check out Crafty Goodness Crochet‘s version of the Mini-Twist Join – the Tight Join! She is using it for her Scrappy CAL blanket. Join border yarn with a treble crochet stitch (YouTube tutorial) in any chain 2 space. Chain 3 and work 3 trebles in the same space. Working in only the chain spaces between clusters, 3 dc, 3 hdc, 3 dc, (3 tr, ch 3, 3 tr) (corner made), 3 dc, 3 hdc, 3 dc, 3 tr (half-corner made). Posted in Free Patterns, Sunburst FlowerTagged Blanket, Continuous JAYG, Crochet, PLT join, TutorialBookmark the permalink. This will be my first project for 2014! Very beautiful! Wow! That looks absolutely amazing!!! This Blanket is just amazing!! Ah that isn’t a coincidence! I got a custom order from a customer who sent me a photo and it looks like it was your blanket!! I’m so excited, you have no idea! I’ll put in lots of linky love 🙂 How exciting it is to meet you!! People asked me to post a pattern back when I did the blanket, but I didn’t have the energy to sort out all of those yarn labels. Glad you did it instead! Would love to make your lovely blanket but need to ask how did you choose the colors you used? They all seem to blend together so seamlessly sure would appreciate your input on how to go about doing the colors. Thanks for the information that you have so graciously shared with us. If I do this think I would like to do a lacier join the continuous join looks like it might be above my head. I love these patterns! Please put me on your mailing list. Thanks!